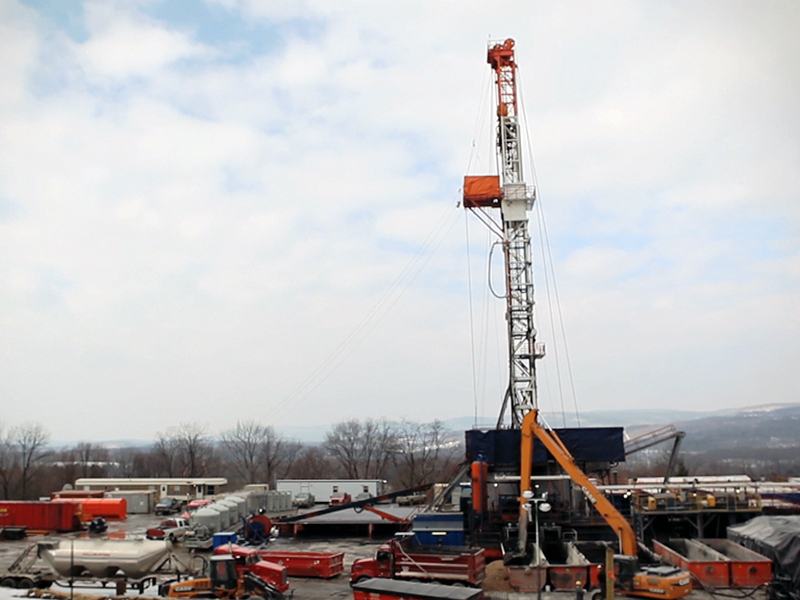 An Earthjustice partner tells of the fight to protect his community from fracking. Jim and Jenni Slotterback smile in a photograph near their home, which is now being threatened by fracking. Sometimes hope is all we have. We can plan, organize, research and prepare all we want. Then comes the moment of truth we have to reckon with. My wife, Jen, and I live in Hepburn Township, Lycoming County, Pennsylvania. We have been active on the issue of gas drilling since October, 2010, when Jen found survey stakes on one of her favorite trails in a local park. We’ve been speaking up for our communities and special places ever since. We joined the Responsible Drilling Alliance (RDA) in the nearby town of Williamsport and now serve on the its Board of Directors. As regular citizens go, we are well-informed about the gas industry and its practices. Up until 2010, much of the gas activity had happened to the north and east of our home, but every day it crept closer. As the drilling approached, we met with experts in areas such as chemical safety, air quality, environmental engineering, safety and health to learn more about gas drilling and its dangers. On November 7, 2014, Inflection Energy filed for a conditional use permit to drill the first gas wells in Hepburn Township, less than one mile from our house. On December 13, we spent eight hours and forty-five minutes at the conditional use hearing. It was grueling. We arrived at the meeting with a lawyer, a chemical safety engineer to discuss air quality issues, a biologist, members of the RDA Board and Working Group, health and safety professionals, and neighbors that we had met after going door to door to arm them with knowledge. Unfortunately, we did not have experts on land use matters or health effects who could testify on our behalf. I know that we are luckier than most to have so many resources available to us in such a small rural community such as this. But, I don’t know if any of it will make a difference. What transpired at the meeting were classic industry shenanigans that I had only read about up until then. First, Inflection’s attorney showed a map with Inflection’s idea of who would “have standing to speak as a party” based upon a circle drawn with a one-mile radius. She asked that anyone outside of the circle be automatically disqualified as a party. The supervisors obliged. This action eliminated a few of our neighbors, but most of them were within one mile so they were able to participate. Then Inflection testified that it was in the business of selling gas, “not drilling for gas,” and characterized drilling and fracking unconventional gas wells as mere “construction” activity, like building an addition on one’s home. Much of the testimony that Inflection presented was in the form of self-serving opinions, but when citizens cross-examined on this testimony, Inflection argued that the questions were irrelevant because the hearing was on a land use matter. Residents who spoke were cross-examined by Inflection’s lawyers to show they were not “experts” in land use law or gas drilling, as if that had anything to do with whether they would be affected by drilling and fracking in the middle of their neighborhood. Our frustration and disappointment with the process actually began before the hearing, when township officials directed us to an outdated version of the township’s zoning ordinance that did not contain extensive oil-and-gas-related amendments that were passed in 2011. At a township meeting last October, I asked for the latest copy of the township ordinances and was directed to Hepburn township’s website to get the latest amendments. Jen carefully reviewed the zoning regulations and sent a letter to the township pointing out some discrepancies in its zoning. She asked if we could be part of a citizen’s group to help correct the errors. We never heard back from the township until the evening before the December 13 hearing. That evening, the supervisor responded with a link to the 2011 zoning amendments, which had not been listed on its website. Due to this oversight we had spent a month preparing for this meeting using outdated information. To make matters worse, the amended ordinances were obviously written to allow gas development everywhere but one little square mile of the township. At the hearing, Inflection presented its case, which basically came down to this: It’s a temporary use; it’s not industrial; we’re the experts; we’re great guys; we’ll work with all of you to minimize impacts and concerns. I wasn’t convinced. The residents also presented their case, and those who showed up and stood up for our community heartened me. I would estimate that there were approximately 24 residents who fell within the 1,000 mile radius, 9 RDA members, and maybe another dozen or so residents who lived outside of the radius. They voiced many heartfelt, specific and emotional concerns. I believe our township supervisors were truly moved by some of the testimony. However, from a pure legal standpoint, the majority of the citizens could offer little. Much of this decision will be guided by Pennsylvania, Act 13. Originally the act removed the right of local municipalities to determine locations and conditions of gas drilling activity. However, parts of Act 13 were struck down as a violation of the Pennsylvania constitution, which states: “The people have a right to clean air, pure water, and to the preservation of the natural, scenic, historic and esthetic values of the environment.” The right for municipalities to control where gas drilling is allowed was returned, but after this process I wonder what that means. I honestly have little hope we will be successful in stopping local drilling, but Jenn and I will continue to fight for our land and community. The determination will be announced on January 5 at the next supervisor’s meeting. For now, I have to get back to my life and enjoy what may be my last well-free Christmas. Jim Slotterback is the President of the Responsible Drilling Alliance. Earthjustice produced a short film about Jim and his wife's efforts to save a local park near Williamsport, PA.